I created these pieces because I am a teacher. Over the years have I taught kids from preschool age through college. Years ago The Kansas School Nurses Association requested Tom cut out a large apple about 8" high on a nice base. One of their members painted it for presentation to the Governor of Kansas, as a gift from their Nursing Association. We enjoyed the apple idea so much, we made several more for the School Secretaries and little tiny ones for jewelry for Teachers. We round the edges of the apples and cut a separte leaf, with rounded edges, that is glued on to the apples. I have to paint at least 5 or more coats of red on the wood to get it to be the wonderful red we enjoy so much. 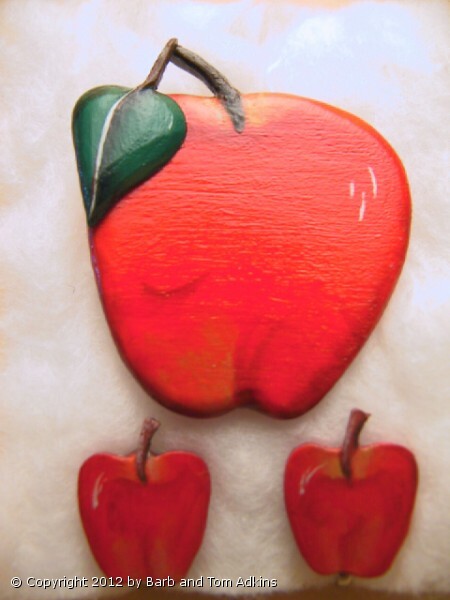 The apples can be for a necklace or a pin. We make the earrings for pieced or clips ons. The pins are so small the pin finding can not be found in Gold Plate. We have to use the only pin back we can find that fits on the back.